The dry granite stone cladding has reached a top level in terms of beauty, durability, discoloration, and flatness. 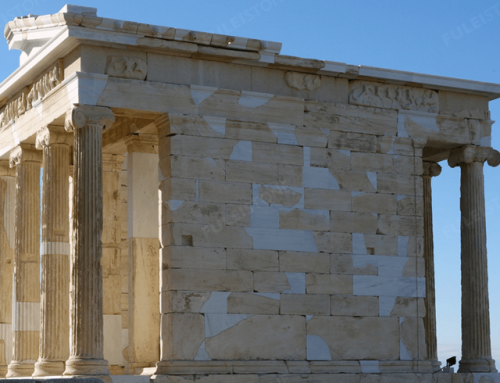 It overcomes the defects of the traditional wet-wet method of stone cladding, and is widely used in the exterior wall decoration of large-scale civil buildings. 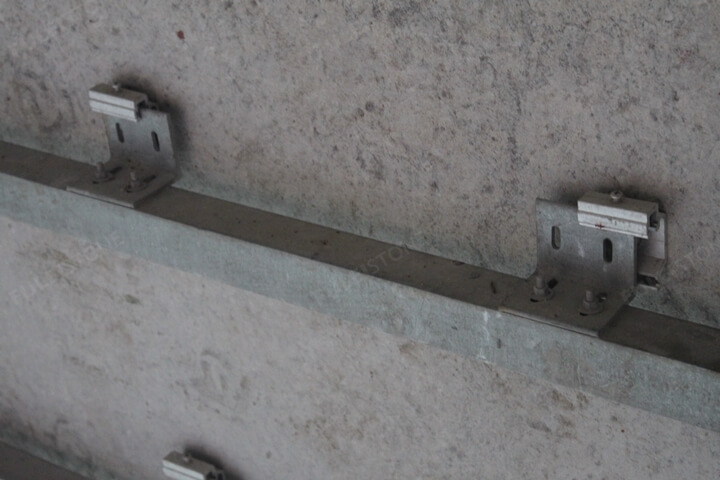 In the construction of external wall stone dry hanging, due to factors such as material selection and improper construction methods, safety and aesthetic problems will arise, so we should pay great attention to it. In this article, we will describe in detail how to detect the quality of the dry stone cladding systems. Establish and improve the material inspection system, and strictly inspect the various materials according to the construction quality acceptance specifications and design requirements. The special materials used shall have the factory certificate and inspection report, quality assurance data, and the material mechanical properties test and stone radioactivity test report. In addition to the various test data provided by the factory meet the requirements, according to the regulations, some materials must be on-site witness sampling and sampling inspection, and the sampling retest is qualified before being approved for construction. According to the design requirements, determine the variety, color, pattern and size specifications of the stone tile, and strictly control and check its flexural, tensile and compressive strength, water absorption should be less than 0.8%, freeze-thaw resistance, and other properties. 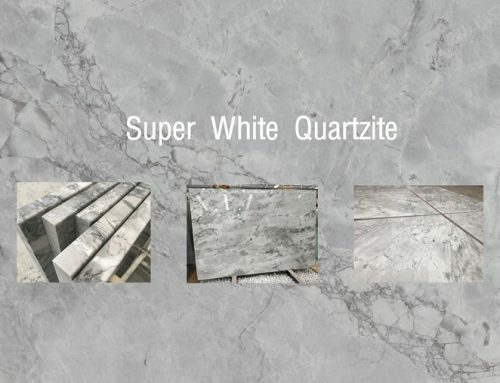 The formation conditions of granite stone are complicated, and many defects after stone processing will be revealed. The most common defects are hole defects, natural fracture defects, and sawing of blocks and causing broken plates during transportation. Damaged or defective sheets can be restored through bonding and repair processes. Reforming adhesion and filling are the two most common methods. The Method of reforming adhesion. For some cases where edge breakage occurs, splicing and reforming bonding are first required. For a slightly larger area, back mesh reinforcement is also required. 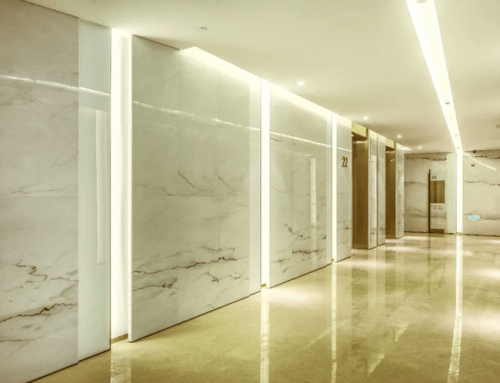 Refining and bonding generally uses a stone-specific adhesive in the form of solids and liquids, and the colors are transparent, yellowish or other colors. The method of filling defects. For the hole type defects, due to the randomness and irregularity of the distribution of these hole defects, the plates are manually repaired and filled. For small-sized hole-type defect plates, the direct repair glue is used to fill the repair method. For some defective plates with large hole sizes, stone powder or stone mixed glue is used to fill the repair method. 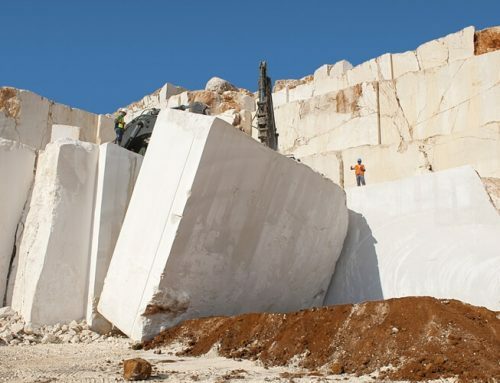 Stone powder and stone must be obtained from stone scraps of the same kind, because the color and pattern of the stone can match the nature. .
Products that meet national or industry standards must be selected to ensure that quality defects do not occur. 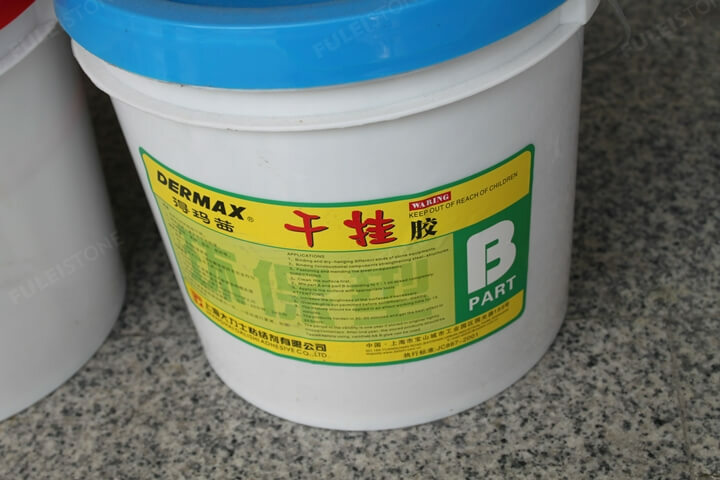 If the glue in the gap of the stone is not a special glue for the stone, the quality of the bond is not guaranteed, and leakage is likely to occur. The main steel or aluminum profiles of fixed stone must meet the design requirements. The steel should be galvanized. If it needs anti-corrosion, it must be strengthened. The surface of the aluminum should meet the national AA15 thickness requirements. The thickness of the pendant should not be less than 4.0mm, and the thickness of the stainless steel pendant should not be less than 3.0mm to ensure the strength, rigidity, and durability of the base material. 1. Measure the axis and elevation of the structure, check the size of the stone design to find the error, and distribute the error evenly within the control network to determine the actual size of the overall control network. According to the adjusted control network, check the indwelling deviation and quality of the embedded parts to determine whether the installation requirements are met. If it is not possible to contact the designer, take corresponding remedial measures. 2. According to the requirements of the design drawings, use the theodolite to shoot the vertical control lines on both sides of the large angle, preferably at a position of 500px from the large angle, so as to check the accuracy of the vertical hanging line at any time to ensure a smooth installation. It is better to use the steel wire of φ1.0～φ1.2 for the vertical hanging wire. The upper end is hung on the special hanging angle steel frame. The angle steel frame is fixed on the top of the big corner of the building with expansion bolts. The opening of the frame is open and fixed, and it must be hung in a place that is firm, accurate and not easy to touch. It must pay attention to protection and regular inspection and check to prevent displacement, so as to ensure the closure of the dry hanging stone and the gap. All connector materials are in-situ sampled and tested with relevant test reports. 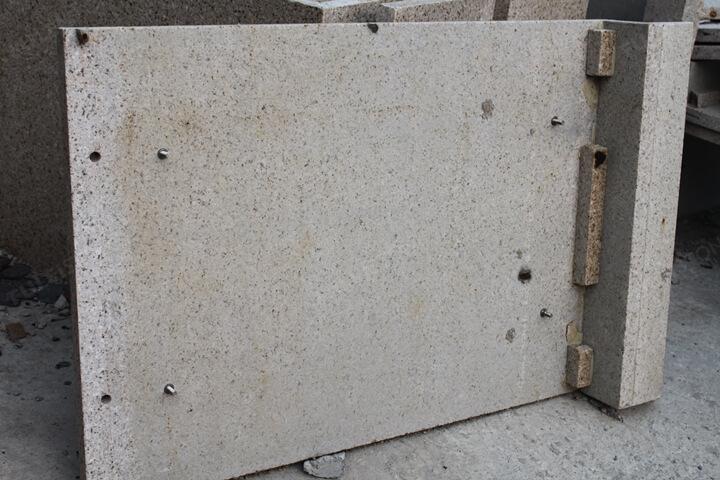 The stability of the gusset is the key factor affecting the safety of dry hanging stone. 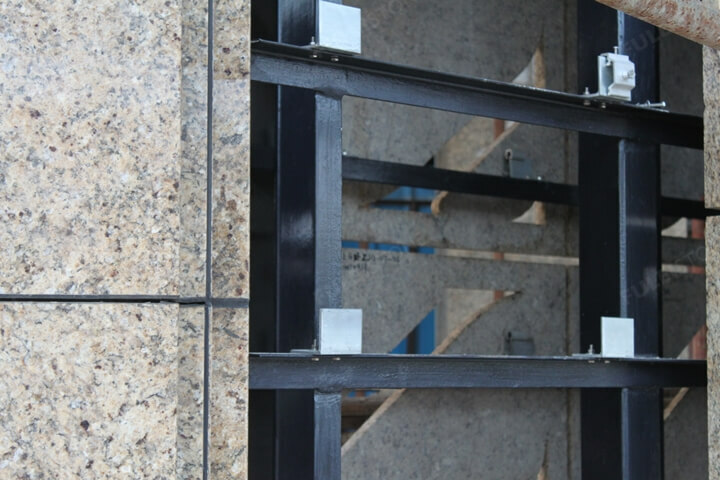 The gusset is used to connect the building to use the corner code to fix the steel frame and connect the stone, which can play the role of supporting the upper and lower. 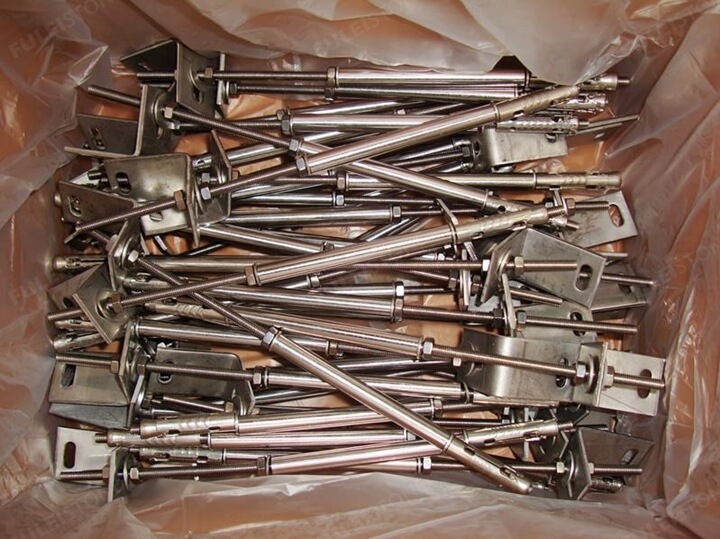 The gusset construction is mainly divided into welded joints and expansion bolts. connection. The welding connection is mainly to use the pre-embedded parts and weld the welding. Before the welding, the welding should be carried out. After the test is passed, the welding can be carried out. The galvanized protective film of the gusset is damaged due to the welding and the gusset and the embedded are suitable. The gap of the piece, so it is necessary to carry out rust prevention and sealing of the gap after welding. 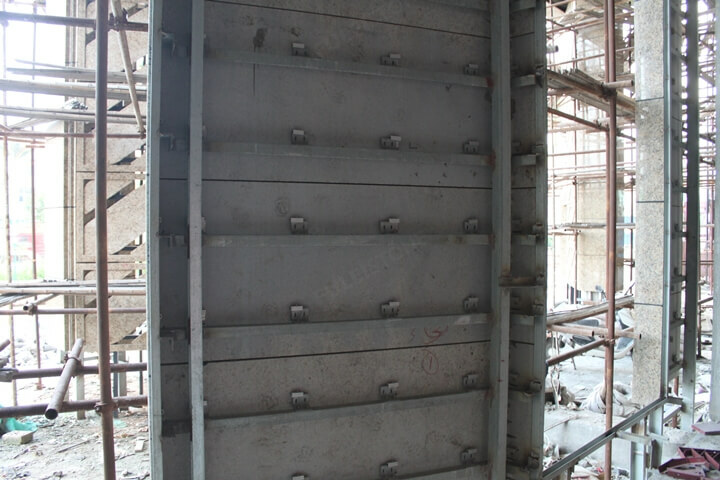 Expansion bolt connection, because the physical drawing test is carried out on site first, meets the design requirements; the drilling machine should be kept horizontal and vertical when drilling, and the sand in the hole should be blown out by the wind; the inner expansion lining and the inner expansion pin must be fully expanded. After the bolt is screwed in, try to withstand the inner expansion pin. If there is a gap, fill it with glue; the bolt, fixed angle steel, flat washer, spring washer must be flattened so that the angle steel is close to the structural layer, and the resin binder is used at the same time. Fix the screw to prevent loosening; when the connecting piece is connected with the fixed angle steel, the current rear left and right adjustment must be tightened, and the nut is fixed with a resin adhesive to prevent loosening; the construction of the inner expansion pin is checked and accepted. And at any time to conduct spot checks and test and make hidden records. 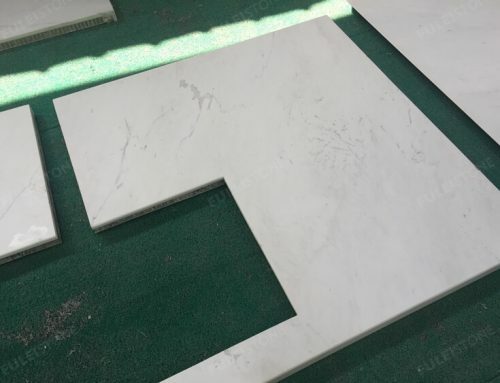 According to the treatment method of the stone joint seam, the first type is not separated from the seam, and the plates are naturally connected. The defect of the method is that the expansion and contraction of the sheet is limited due to the temperature difference, and it is not suitable for wide use in the outer wall surface; There is a gap, the gap of the sheet is usually 6~10mm, generally filled with foam strips, and sealed with weather resistant silicone rubber. The caulking mixture has the performance of the warranty and various indicators. Before the caulking, the stone should be treated according to the seam, and the air and dust should be blown off by the air compressor. Fill the inside of the board with foam strips. The depth of the press-in should be uniform according to the depth of the joint, and press into the joints. Do not loosen too much. It should be enlarged to help control the joint depth. 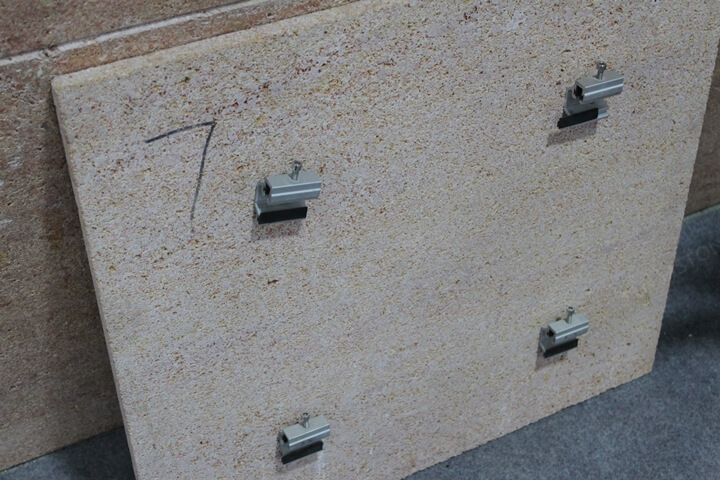 When filling the joints, be sure to put tape on the seams to prevent the seam from contaminating the stone surface. When filling the joints, the caulking agent must be continuously dense and full. It is strictly forbidden to cut corners and fill in according to the regulations to prevent water seepage. During the construction, QC should be specially equipped to carry out joint inspection and make a covert record. (4) Clean the neutral cleaning agent to be corrosive before use. Wash with neutral detergent and rinse with water in time.